Bryan Singer officially directing X-Men: Days of Future Past! 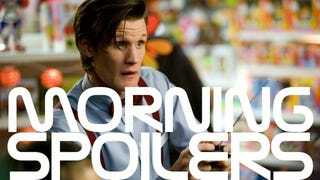 Welcome back to Morning Spoilers after an unscheduled break! In today's roundup, the future of X-Men: Days of Future Past is settled. Captain America gets a villain and Robopocalypse gets a star. There are new posters for The Wolverine and Hansel and Gretel. Matt Smith talks about the possibility of a Doctor Who/Sherlock crossover. And much, much more! As The Wrap points out, the Wikipedia page for this movie contains basically the whole plot. The facts were frightening - and making a documentary didn't interest me enough. But the facts stayed with me. So we made a sci-fi movie like in the 1950s, which used science fiction to deal with the real fears we had… The idea was - what if some catastrophic thing happened? What if no media was allowed in? How would we know? Oh my god that would be amazing to cross over to the original series!! I'm not sure that would happen but I guess anything is possible when you're dealing with time portals. There is definitely crossover between the two shows being that Andrew Lee Potts' character was able to crossover into our world and, yes, there is some really cool stuff that develops in the finale that will get the fans very excited for a Season Two (fingers crossed that happens)! [In] Episode 5, we learn why he was in purgatory, how he got there. We learn a lot about Benny's backstory… The trouble that Benny gets into is that he's got some loose ends to tie up, so to speak. There's a pressing reason why he wants out of purgatory and a need to clean up those loose ends and resolve what happened before. There's a really interesting storyline about where he came from and how he got into purgatory and how he died and how he was turned. It's a driving force that gets him in the middle of a pretty messy situation. And it's powerful enough for him that it becomes a single focus. That's what drives him to get out of purgatory, why he searches out Dean. Sam asks Martin to keep an eye on Benny after some unexplained deaths in Benny's hometown. Dean won't be particularly happy about it - and when Martin finds out that a Winchester has teamed up with a vampire, he will not be impressed. Chapter 6 – "The Origins of Monstrosity" (Airs November 21, 10:00 pm e/p) – A mysterious little girl is abandoned at Briarcliff. The Monsignor makes a Faustian pact with Dr. Arden. The origin of Bloody Face is revealed. Written by Ryan Murphy; directed by David Semel. GAME-CHANGING FRINGE EVENTS OCCUR - As the fight for the future intensifies, a member of the Fringe team orchestrates a Fringe event of his own. We always say that if Oliver is the dark the Dig is the light and the truth is somewhere in between. They really need each other - Oliver needs someone to remind him of the value of life and that the extreme way is not the only way. And that sort of push and pull between the characters has given us so many great episodes because you get to see them not just having fun as partners but also see them wrestle with the morality of this quest they are both on. Additional reporting by Rob H. Dawson.